In November of 2017 Darren Julien, President and CEO of Julien’s Auctions, sent me a text message that read, “I’ve got a special project for you if you’re interested. Let’s talk this weekend.” It wasn’t unusual to receive a text from Darren considering the number of times I’d already consulted with Julien’s Auctions. He often reaches out to me about topics or memorabilia related to Marilyn Monroe. Usually, however, he just comes right out and lets me know what he needs or what the work is. In this case though there was a level of mystery that was unusual for him, and my curiosity was definitely piqued. 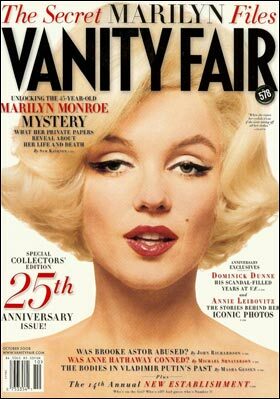 Being a Marilyn Monroe collector for nearly twenty years I’m considered an expert in the field. Through buying and collecting Marilyn Monroe memorabilia, I’ve developed a strong network and relationships with auction company owners and staff, as well as with fellow collectors. Julien’s Auctions occasionally partners with experts in the entertainment memorabilia world, providing them with the opportunity to see the other side of the auction industry. This also offers them the chance to handle some amazing objects closely related to their personal interests and passions. 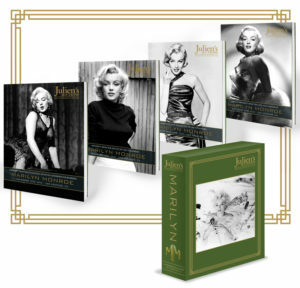 I’ve worked closely with Julien’s on many exciting projects over the years, most notably their record-breaking Marilyn Monroe auction in 2016. The Happy Birthday Mr. President Dress sold for a record breaking $4.81 million at that auction. It was a thrill for me to catalog the world-famous David Gainsborough-Roberts Marilyn Monroe collection for that auction. 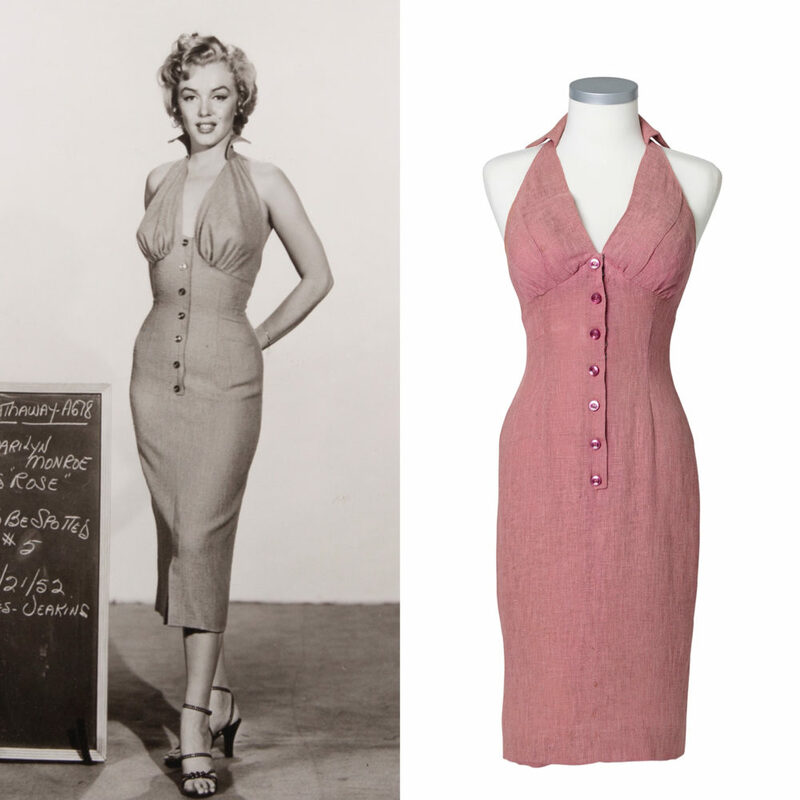 His archive included film worn costumes, personal clothing and gowns, and Marilyn Monroe personally owned items. 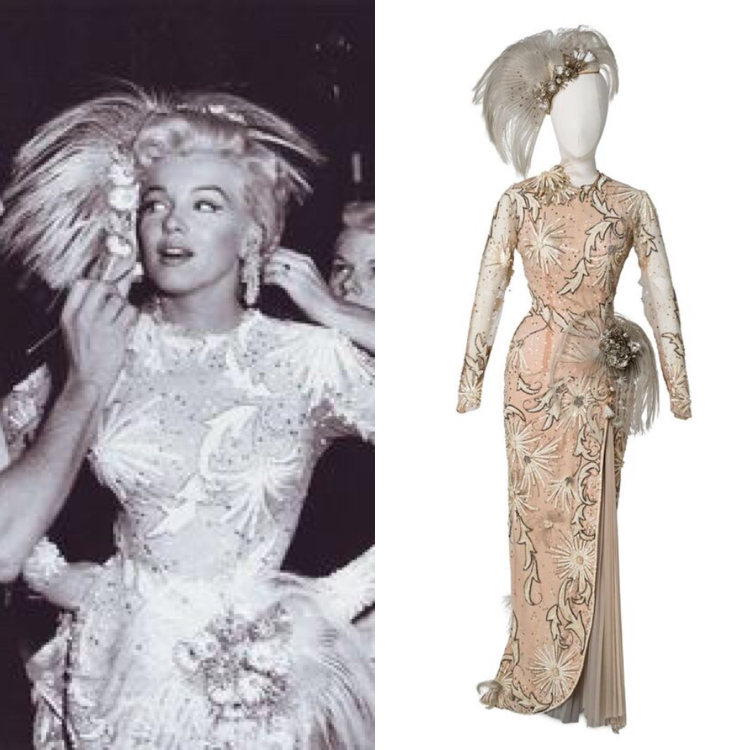 Highlights from David’s collection included a sheer black beaded and sequined dress worn by Monroe in her Golden Globe winning role of Sugar Kane as she crooned “I’m Through With Love” in the award winning 1959 film Some Like it Hot; an elaborate embellished stage gown worn by Monroe as she sang “After You Get What You Want You Don’t Want It” in the 1953 comedy There’s No Business Like Show Business, which was designed by one of Marilyn’s all-time favorite designers, William Travilla; a pink linen halter wiggle dress designed for Monroe by Dorothy Jenkins for the 1953 thriller Niagara; and a green satin one-piece with black sequins and gold fringe worn by Monroe as she sang “That Old Black Magic” in the 1956 film Bus Stop. 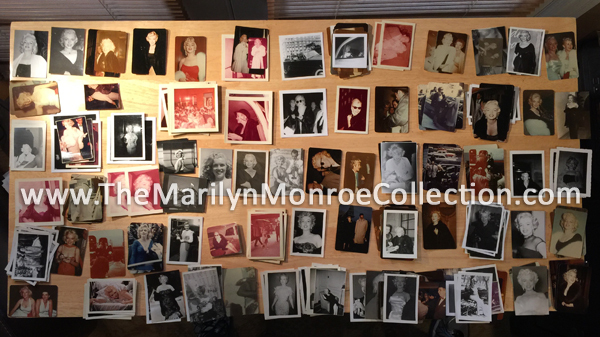 For that same auction, Julien’s asked me to catalog hundreds of original snapshots of Marilyn that were taken by Frieda Hull and other members of the Monroe Six, many of which had never been published. Above: Original snapshots of Marilyn Monroe, from the Frieda Hull Collection. I had thought there was a good chance it was Anna, but it was unclear to me what was left from Marilyn’s estate. With three Marilyn Monroe estate auctions having taken place since 1999, my assumption was that everything had already been sold. 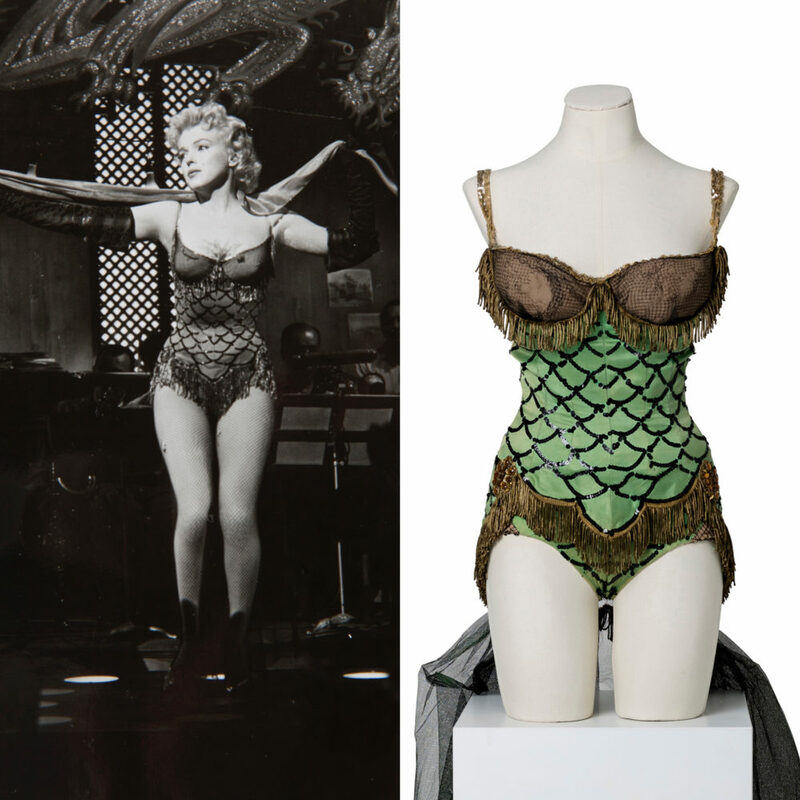 When I asked Darren about this, he said there was a vast collection of licensed first-run and prototype memorabilia and merchandise that she was going to offer to collectors, and also there was a slight chance that there were still some Marilyn Monroe estate items left in storage. She wanted to go through everything to see what was left. Of course, I jumped at the opportunity. 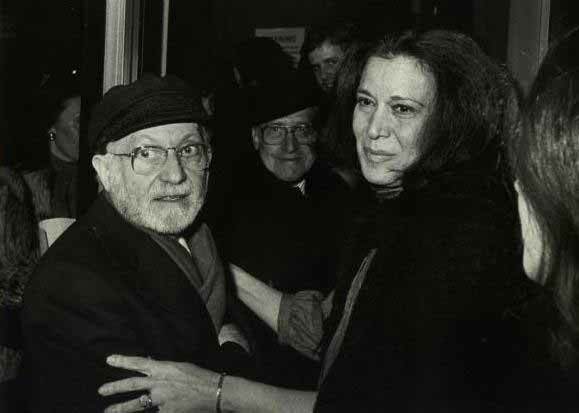 Anna Strasberg was the third wife of famed acting instructor Lee Strasberg. Lee was Marilyn’s close friend, confidant, and acting teacher, and they had met in 1955 when Marilyn left Hollywood and moved to New York. When Marilyn died, she left the bulk of her estate, including all of her personal effects, to Lee. Anna had managed the estate of Marilyn Monroe since Lee passed away in 1982. Famous in her own right and intensely private, I was curious and excited about meeting Anna Strasberg. Aside from Darren, I didn’t know of anyone who had ever met her. Anna had allowed me to interview her in 2016, but our exchange was completed via email. I hadn’t met her personally or even talked to her on the phone. Over the next several weeks Darren and I chatted more about the project, and then I finally got a chance to speak with Anna on the phone. We talked several times in January and February 2018. We discussed the project, and made plans for me to visit her in New York to help her review the memorabilia and search through her storage areas to see if there were any remaining items from Marilyn’s estate. My first trip to New York was in March of 2018. I took the redeye flight to New Jersey landing very early the morning of the 8th. I rode the subway into Manhattan. After a quick breakfast at a local restaurant I arrived at Anna’s home around 10:30, which was the previously agreed upon time. What a story ! I can’t wait for part II. I like how you write the story. Seems I live the story. Amazing story I absolutely love it! I’have been a huge fan of Marilyn Monroe for a long time! I can’t wait to see the rest! Thank-You for sharing your story with the rest of us. It’s so amazing- and I can’t even imagine the emotions that you were going through. Wow!! I can’t even imagine how nervous you might have been. How lucky you are! Wow! Thank-You for sharing your story with all of us that love our Marilyn! Amazing! What an experience!! Thanks for sharing Scott! Marilyn Monroe,was simply the most beautiful woman,this world has ever know!She overcame huge obstacles,most would stop at!The big irony is,as much as she yearned for a baby and a good loving man,she never had either!I do think Joe DiMaggio,truly loved and treasured her.I still am saddened by the losses she had,and it lead to her untimely death.Rest well,dear lady.